We are a top notch supplier of CNC Router Bits. To cater the variegated needs of our esteemed customers, we are highly engaged in offering a wide array of CNC Router Bits. By keeping track with the market development, we are offering optimum quality CNC Router Bits. Our provided bits are manufactured by a team of our professionals utilizing quality approved raw material and advanced technology. 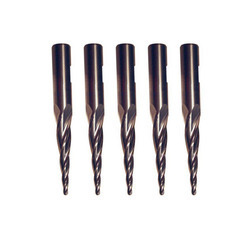 We are a reputed entity in the industry, actively engaged in offering an optimum quality range of CNC Router Bits. Carbide End Mill & Carbide Ball Nose. Tungsten carbide Cnc router 2mm 2 fluite end mill cutter. We are amongst the most reputed names in the industry, offering Cnc Router Bits. We are No.1 dealer in CNC Machines in kerala and have sell 42 CNC Machines all over Kerala . We are selling very High Quality CNC Router Bits for Cutting/Engraving wood, acrylic, Multiwood , ACP etc.